Babylon 9 maintains the lead with more languages, full web page and document translation and seamless integration with Microsoft Office speller. Babylon 9 brings the following new features and enhancements: Babylon Live Translation Community, Spelling and Proofreading, Human Voice, More Languages, More Sources, Full web page and document translation, seamless integration with Microsoft Office speller, easier access to dictionaries and encyclopedias and much more. Simply click on any text in any desktop application to get immediate translation and access to dictionaries & encyclopedias covering a wide range of subjects, categories and themes. Babylon automatically recognizes the languages you use and need, and delivers results in those languages. * Live Translation Community NEW! Babylon 9 enables you to easily participate in BabylonвЂ™s large community of native speakers and professional translators worldwide. * Spelling and Proofreading NEW! Babylon Speller and Proofreading is at your service to ensure you did not omit or skip anything important and allows you to catch errors (be it typos, grammar, etc.) which you may have made when writing. Babylon delivers results from the world's premier publishing houses (such as: Oxford, Britannica, Merriam Webster, Pons, Larousse, Duden, Langenscheidt and many more) to enhance your translation experience and knowledge. 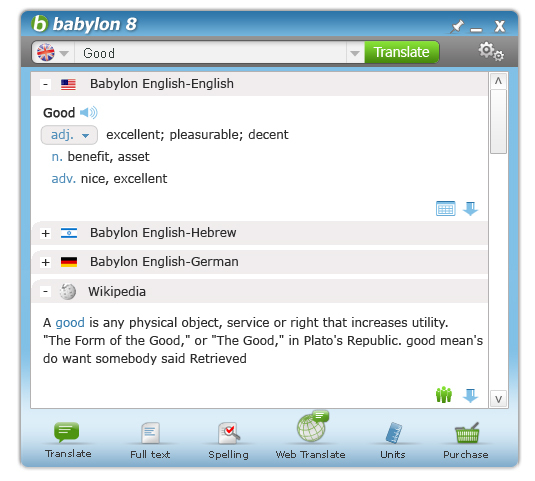 In addition, Babylon provides results from over 1,600 user generated glossaries and dictionaries. Babylon delivers results from Wikipedia in over 25 languages, covering millions of articles and definitions that are constantly updated to cover current events and recent innovations. When spelling suggestions are obtained from MS Office, Babylon provides a short translation for each suggestion indicated in MS OfficeвЂ™s speller menu. Babylon provides translation of full web pages, documents (MS Word, PDF, Text, etc.) and text between 33 languages, all in a single click. Babylon helps you convert currencies, measurements and world time zones. Just click on any value in any desktop application to get instant conversions.